nothing special lar... except one of the young aunties kept on asking me to sit facing outside so can see chicks... we mah ordered la, goldfishing around while waiting for the food to b served. 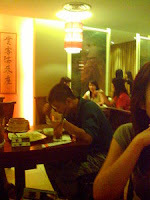 i was abit exhausted n sleepie... then i incidentally found out 1 gentleman opposite of me kept staring at one of the aunties, err... full wit faith n luv like luv at 1st sight ... i mah then quickly verified if the auntie got "ppl" today... takda wor, then how come the gentleman looked at her like his savor o kuanyinma??? oooo... tat proved auntie still got strong radioactive n electromagnetic field leh, "short circuit" the guy till he behtahan leh... she din even look at him eye to eye, but the guy still kena short till dunno who is laopeh laobu!! Back From Lifeless Place, Getting Back My Life!